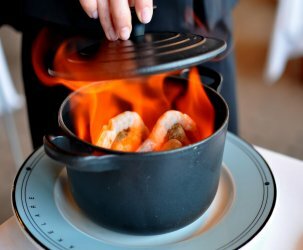 By my estimates, The Gastronomer and I have now eaten over 100 restaurant meals in Vietnam, and rarely have we regretted our choice of venue. Truly, the consistent quality of the offerings in Saigon is amazing. 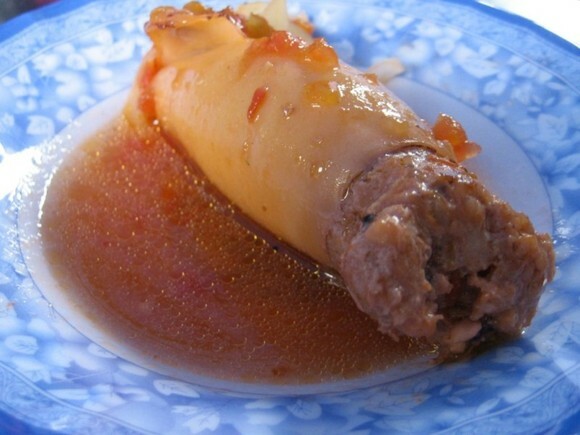 Of the few disappointments we’ve experienced, most fell under the category of com binh dan. 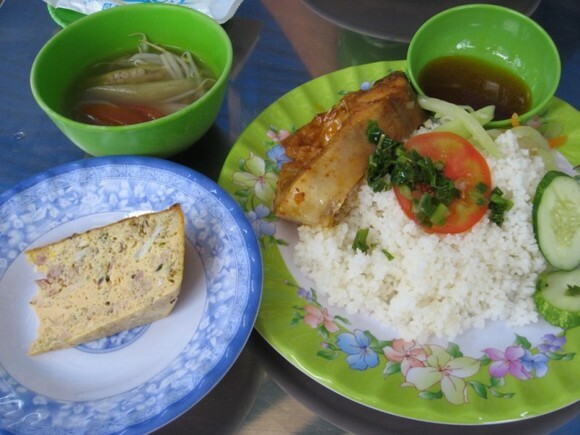 Literally meaning “worker’s lunch,” this genre is the most popular midday meal among the laborers of Saigon. 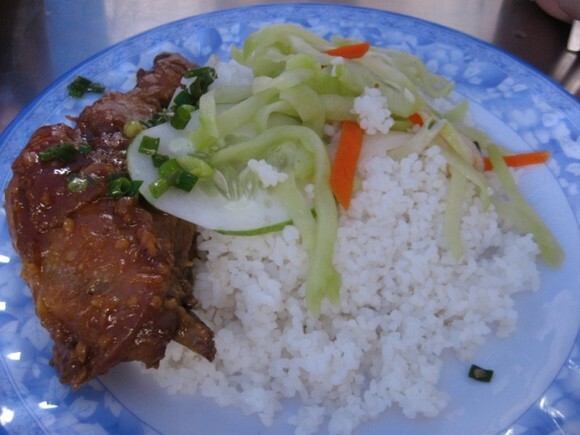 It consists of a relatively basic plate of rice, complemented by a few small pieces of meat (selected from a display cart at the front of the restaurant) and perhaps a vegetable. 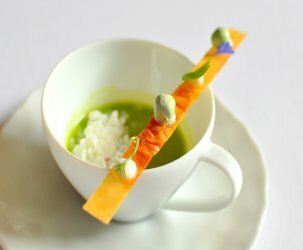 If the meat or fish is good, it can be a treat, but too often the protein source is mediocre, the greens are bitter, and the place is a bit too dirty for even our taste. To put it another way, com binh dan eateries seem to have a difficult time matching the quality of meals at our favorite neighborhood vegetarian spots, even though they have the unfair advantage of being allowed to use meat. However, we have found one exception in District 3—Com Tam. From the first time I walked by, I knew this place was special. The tables are a little higher, the clientèle’s tastes a bit more discerning, and the food up front just looks more delicious than the typical com binh dan. Normally I’ll only see one or two meat dishes that pique my interest, but at Com Tam it was hard to decide. Thankfully, I returned several times and got to try multiple treats. 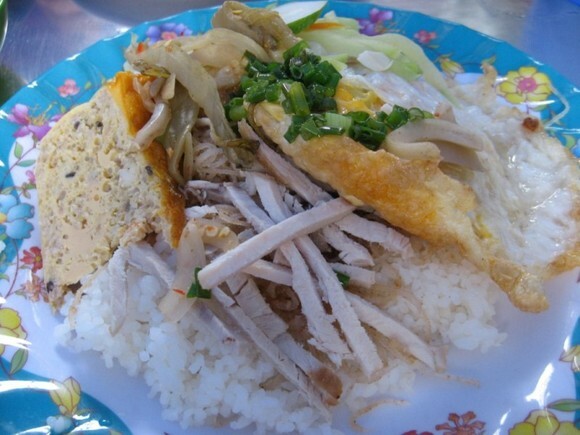 The culinary appeal of Com Tam starts with the rice. I really love com tam. While I recently learned that it is cheaper and perhaps considered less desirable by the Vietnamese than other varieties of rice, I find it to be far superior in most cases. Its short, broken grains lead to a drier texture than that of standard long-grain rice, and it complements certain entrees, such as the Gastronomer’s dau hu xa, extremely well. The soup was also a nice bonus; in contrast to the watered-down bowl of foul-tasting vegetable matter that accompanies a typical com binh dan meal, diners at Com Tam are treated to a small, but satisfying bowl of canh chua (featuring okra, upright elephant ears, and perhaps some tomatoes in a delicious mild broth). However, it was the meat offerings that drew me into the restaurant, and they didn’t disappoint. Among my favorite entrees were the thit nuong (chargrilled pork slabs) and bi cha (thin strands of pork served with a yellowish, pork-based meat loaf). 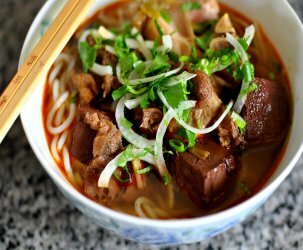 Most often served with bun (rice noodles), thit nuong is one of my all-time favorite Vietnamese preparations. The barbecued surfaces of the meat have a truly wonderful flavor, which is further enhanced by a few spoonfuls of nuoc mam. The thit nuong at Com Tam came in bigger slabs than I’m used to—there were even a few bones involved—but the taste and texture were amazing as always. 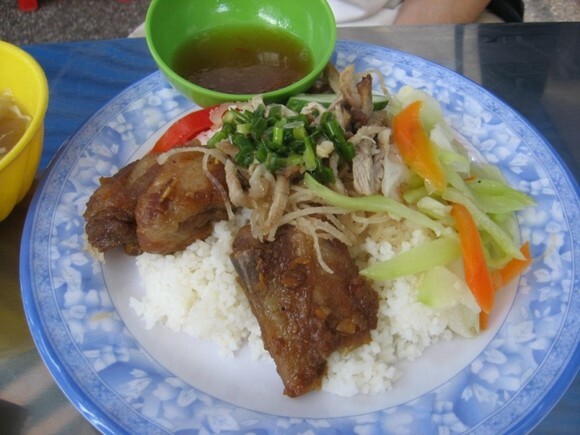 Several years ago, long before we arrived in Vietnam, The Gastronomer informed me that com tam bi cha was her favorite Vietnamese dish. While this may have changed (based on her current ordering habits, I would be inclined to nominate xoi ga chay), it certainly has a special appeal for both of us. Bi is one of the simplest pork preparations—on its own I would go so far as to say that it’s a bit boring—but it turns out to be the perfect vehicle for nuoc mam. Once fish sauce has been applied, there are few things better. I’m not the biggest fan of cha, but it’s fairly tasty and serves as a nice textural diversion from the bi. Both the bi and cha at Com Tam were among the best I’ve tried. During our repeat visits to the restaurant, The Gastronomer and I sampled a number of other entrees, including braised fish, sunny-side up eggs, and stuffed squid. Crammed to gills with meat, the squid seemed like quite a luxury for only 10,000 VND, but in hindsight the combination of flavors was not terribly memorable. Note that it opens for lunch only. Thanks for the tip! We’ll definitely give it a try. I finally got around to trying out your recommendation today for lunch. You were right on–the two meat dishes I got were both excellent, and they didn’t force me to eat any bitter greens. It was indeed a bit pricey, but worth it I think. I never would have known to stop there on my own (although the woman serving the food was quite overweight for a Vietnamese person, so that might have served as a sign that someone in the neighborhood was cooking up some good stuff…). 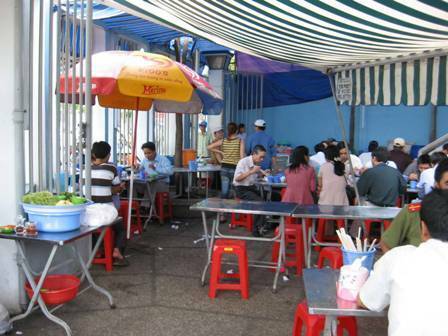 Vo Van Tan is a great food street–there’s a bunch of places I like on the other side of CMT8.